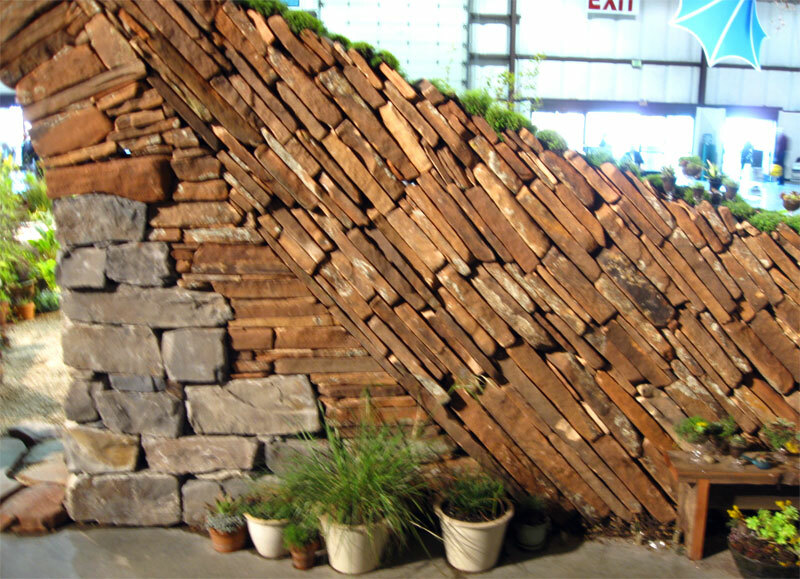 I wanted to post a few more photos of the freestanding wall from the garden show. I haven’t seen many walls with the courses running at an angle, and none quite like this one. To lay the stones at an angle goes against the “rules” I learned about building walls, but, apparently, stoneworkers have been doing it in Cornwall for centuries. 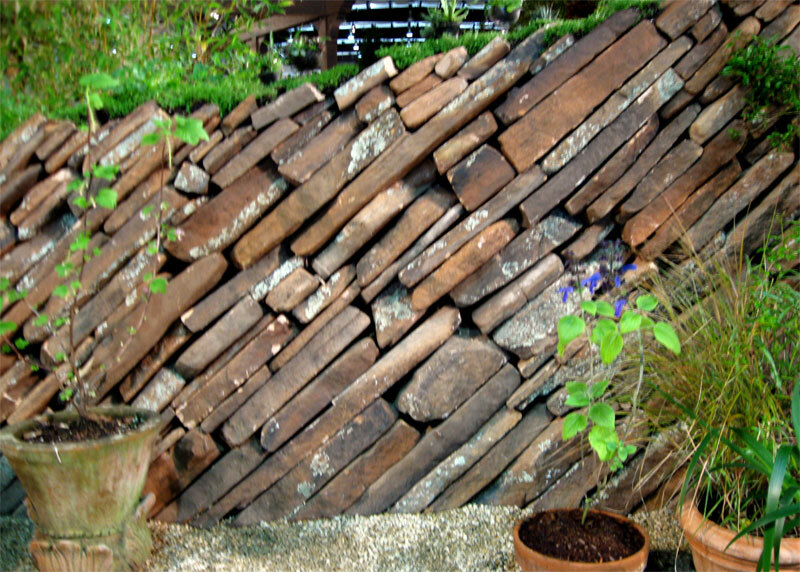 The Cornish call their walls “hedges”, and do things like cover them with sod, and they have a whole tradition of stacking slate vertically or at an angle. Their slate doesn’t support weight well when stacked horizontally, so they turn it on its edge, which makes a certain amount of sense; I’ve worked with slate which would crumble from a single hammer blow across the flat, but could withstand repeated blows against the narrow edge. The Guild of Cornish Hedgers has a collection of photos including some walls built with a herringbone pattern. I particularly like this one with stiles for climbing over it. There’s a photo on a blog here and another photo in the Cornish collection in the Dry Stone Walling Association of Great Britain gallery. Through the magic of turning the camera sideways, you can see that the wall is built with courses like a traditional wall, just that the courses run at an angle. The horizontally laid stones of the arch set the angle for the slanted courses. A lot of the wall’s weight is going to be pushing against those horizontal courses and against that arch, but arches are strong and the wall could have stood for a lot longer than the five days of the garden show. Now it only exists in memories and photos. 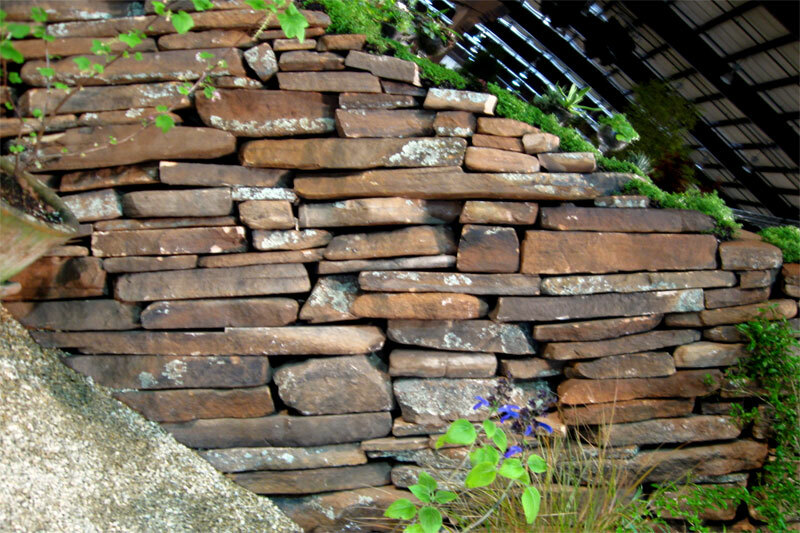 The Dry Stone Walling Association of Canada has more photos of the wall on their site, and photos of another angled wall they built for a garden show in Canada last year. WallsWithoutMortar has photos of another angled wall built in Danville, here. I stuck a couple of detail photos of the arch below. This entry was posted on Thursday, April 2nd, 2009 at 10:56 am and is filed under stone, walls. You can follow any responses to this entry through the RSS 2.0 feed. You can leave a response, or trackback from your own site. 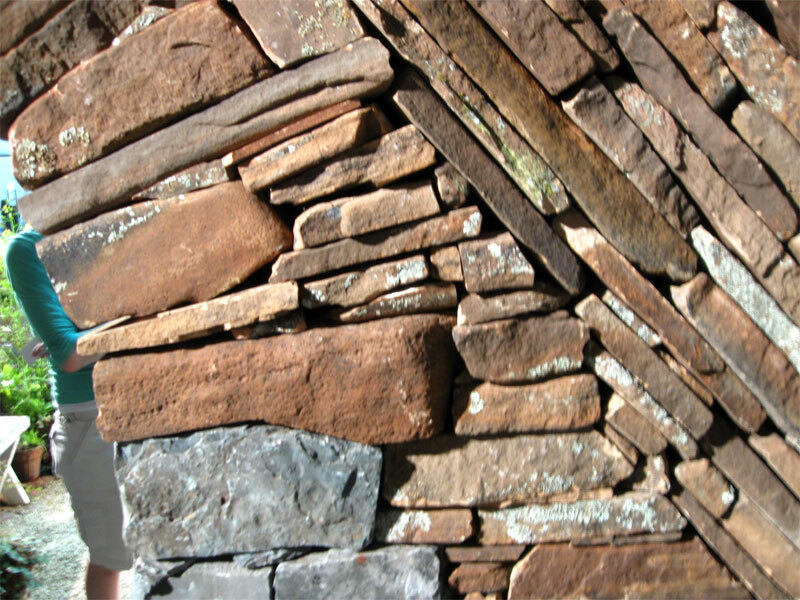 That is an interesting way to use slate to build a wall. Makes sense too. That wall was amazing. One of our favorite things at the show. I’m so excited they’ll be back next year! Thats a great way to give an ordinary wall an amazing impact. I love that Cornish hedge with the stiles! OK now I have to find somewhere to try that. It never crossed my mind to stack stone that way. And against an arch – now I’m drooling. 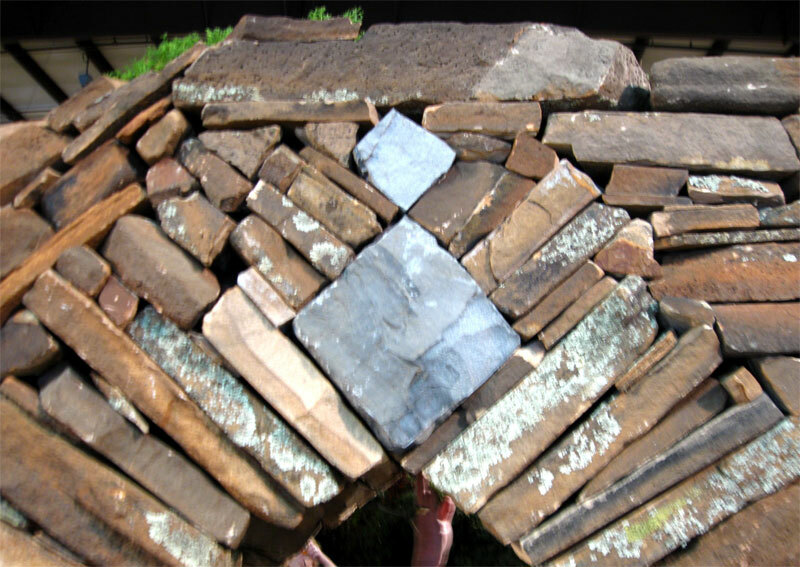 Great to see the Cornish walling being used across the world. Strange stone you have there in California, beautiful shades. We do get a lot of interesting stone out here. Interesting that this particular one lends itself well to the Cornish style. Thanks for your adding the link to your facebook page, some more nice walls there.